The San Francisco 49ers signed former Baltimore Ravens edge defender Elvis Dumervil to a two-year deal Monday, according to NBC Sports Bay Area. Dumervil, who missed eight games last season due to a foot injury, adds pass-rushing depth to a 49ers’ defense that’s transitioning to a 4-3 defensive front. In the final five weeks of last season, Dumervil ranked sixth among all edge rushers with 22 pressures forced from the left side. 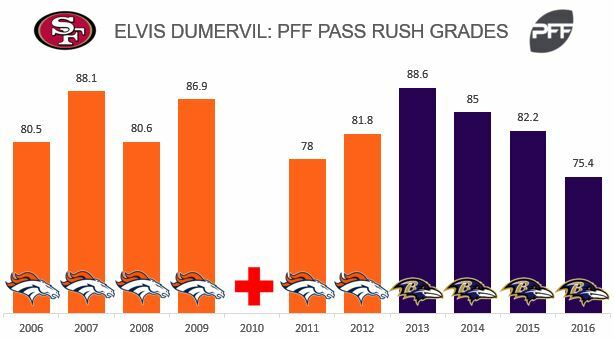 Dumervil applied 55 pressures or more in four straight seasons leading up to 2016. His 2014 campaign was the only season in which he didn’t lead his team’s position group in pass-rushing productivity, which is a measure of pressure created on a per snap basis weighted towards sacks.